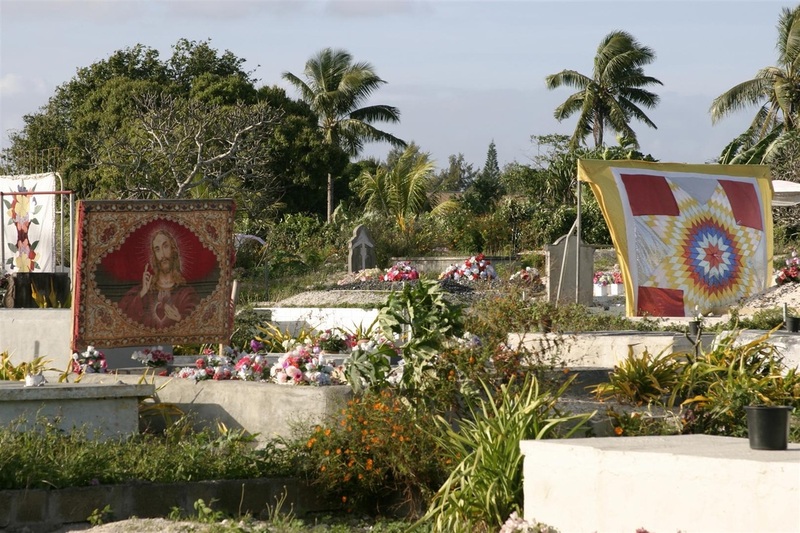 Surprisingly, Tonga was the first country that wanted to retain our shotgun. 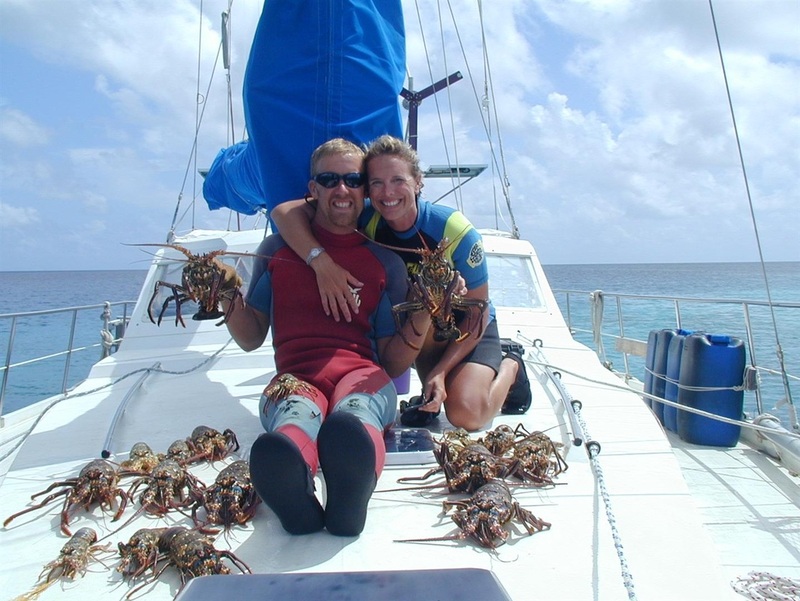 Gathering lobsters in Minerva Reef requires a wetsuit, a spear and at least one "Bucket Babe." 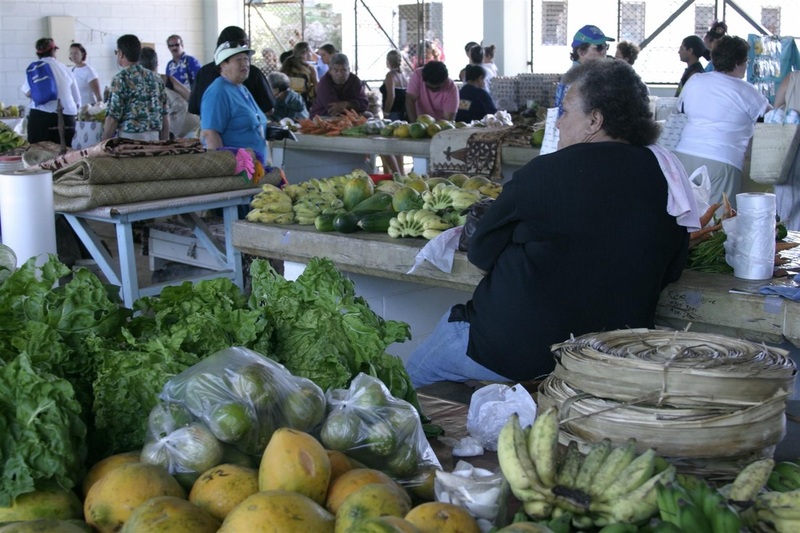 The plentiful and inexpensive produce in Tonga was welcome after weeks without any! "Nine boats departed North Minerva, about 20 miles from South Minerva, for Opua, New Zealand, on Tuesday, leaving just two in the lagoon. The weather was relatively benign, with overcast and 10-15 knots of breeze. The wind was very shifty, however, due to the effects of a stationary front. Three boats remained at North Minerva, which is about 20 miles up from South Minerva. "At about 2000 local time, we heard Pneuma's Mayday. We had been tuning up Russell Radio for the evening roll call, but just happened to pause long enough on the Puddle Jump frequency to hear Guy calling for help. We were not the first to hear the Mayday, as it was heard over VHF on another boat. But we were the first boat that could reach Guy and Melissa by radio. We got them to an emergency frequency to coordinate a rescue. The closest boat to them, Harmony, their buddyboat, could not be reached by radio for several hours after the grounding. "After hearing about the situation, the skippers of Scott Free, a Hallberg-Rassy from Marblehead, Infidien, and White Hawk jumped aboard Scott Free and motored through the night from North Minerva to South Minerva. The women and kids on the three boats stayed behind aboard White Hawk to be the communications boat. Once the three skippers got to South Minerva, they left Scott Free outside the tricky pass and dinghied into the lagoon to rescue Guy and Melissa. Kela, a Colorado-based Sundeer 65 with Kirk, Debbie, Braden, and Grady aboard, had been about 30 miles from South Minerva when the Mayday went out, and were the second boat on the scene. Guy and Melissa are now safely aboard Kela. The crews of Kela and Harmony - the third boat on the scene - spent yesterday and today salvaging what they could. "We are so sorry for Guy and Melissa's loss. They are great folks and able cruisers. We're sure they'll be back out here soon. The crews of Scott Free, White Hawk, Infidien, Kela, and Harmony did everything possible to ensure the swift and safe rescue of the Pneuma crew. We all draw comfort from that fact that there are such capable and caring folks out here with us."